Zanardi chassis manufacturer CRG SpA and current technical and commercial manager of the brand that carries the name of Alex Zanardi, jointly announced the mutual decision to end their collaboration. Dino Chiesa will start a new sporting and commercial adventure outside the Tinini Group and the sporting and commercial activities of the Zanardi range will be directly managed by CRG. The collaboration between CRG’s President Giancarlo Tinini and Dino Chiesa has involved several shared successful projects over the past 25 years. An example is the management of Rosberg and Hamilton back in their karting days, or the successful 2016 campaign when Dino Chiesa and Glenn Keyaert led CRG Racing Team to the victory of 5 CIK-FIA titles, amongst which the KZ and OK World Championships. 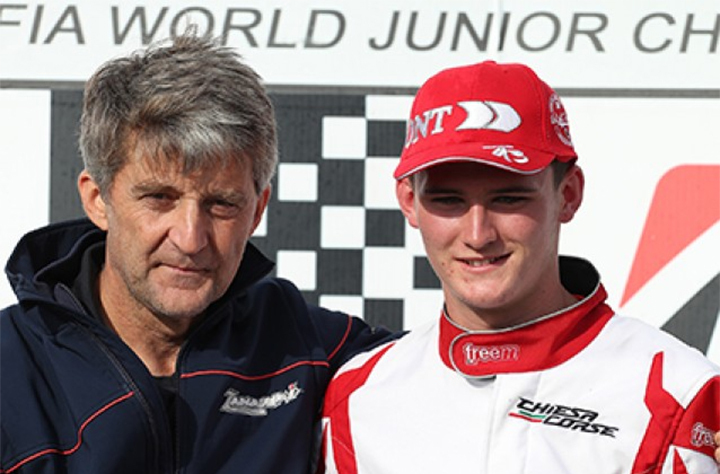 Dino Chiesa’s main activity within the Tinini Group has been connected to the Zanardi brand, the range started in mid 2000s as desired by the Bolognese Champion, who won the European Karting Championship on Kalì Kart in 1997. The launch and reinforcement of the Zanardi range by CRG on the International karting scene has been followed directly by Dino Chiesa. The Italian technician has in fact led the sporting activities of the brand and the commercial development of the whole product range for more than 15 years. A very efficient technical synergy between the manufacturing work at the CRG factory and the precious indications coming from the track, field where Dino Chiesa is certainly one of the most prominent experts worldwide, has rewarded the Zanardi range with several victories, among which 9 CIK-FIA titles including World Championships, World Cups and European Championships. The most recent one has been the OK World Championship taken last weekend at PFI (England) with Danny Keirle. For the new homologation round valid for 2018-2020, Zanardi Kart will assume a new technical structure under the direct management of CRG, that will take care of the racing team and sales network. CRG thanks Dino Chiesa for the precious collaboration over all these years. Such a partnership has been based on a great friendship and mutual esteem and allowed both parties to achieve very relevant sporting and commercial results. Alex Zanardi joins CRG to thank Dino Chiesa. Following the successful campaign at the World Championship, he will be involved with several promotion activities regarding his brand of chassis, contributing to develop a project that he intends to direct to the young champions of the future. While wishing all the best to Dino Chiesa for his new professional adventure, CRG communicates to all Zanardi customers the activation of its commercial offices and an internal customer care to answer any technical and commercial request. The 2018 sporting programs for the Zanardi range will be announced shortly. The racing team will be present in all the main categories, at the most important International CIK-FIA races and national events.